With Iran rapidly becoming the new demon for the West's war on terror, I figured that some background to the country was in order. One of the most important events was the 1979 revolution that kicked out the Shah, who was firmly backed by the US and ended up with the religious leader, Ayatollah Khomeini in power. This revolution is oft described as a Islamic revolution. But Phil Marshall's short book, first published in 1988, tells a different story. The book is now dated - but the Iranian history contained inside is very relevant and the analysis stands the test of time. Firstly Marshall traces the development of Iran. Originally very much on the periphary of modern capitalism, Iran started to develop rapidly in the early 20th Century. Much of this of course was linked to the huge oil resources there. Britain took control of these, taking the oil and most of the profits, which limited the development of Iran further, but increasingly Iran's own developing capitalist class developed their own interests. The last Shah took power as a representative of these forces, and his autocratic rule was very muich in the interest of emerging capitalism. His repression of workers and his drive to develop Iran's industry wasn't allowed to continue unhindered. Marshall traces the development of workers organisations, often underground networks, and shows that the Iran working class has been prepared to stand up for its own interests from the earliest days. The revolution of 1979 itself was a complex affair. Mass demonstrations and strikes took place, uniting the workers with the poor, unemployed and lower middle classes from the Bazaar. The strikes grew in scope and scale, economic demands over pay and conditions mixing with more political demands such as the right to organise, or calling for the Shah to go. Given what some say about how the country is oppressive against Women, it's interesting to note that equal rights and pay for women was a central demand during some of the strikes. Marshall argues that this interplay between economic and political demands is a classic example of what happens during a mass strike. Yet the next stage - the co-ordination of strike committees and activities failed to occur. The workers' committees that did arise, the Shoras, did not advance beyond the immediate needs of the strike in all but a few areas. It is precisely the development of a more co-ordinated strike, with workers starting to take control of workplaces, communities and towns - that has led to revolutionary moments in the past. This led to a power vacuum, and lacking effective leadership from left wing parties or organisations, the Ayatolla was able to use his influence and the network around the mosques to put himself at the head of the anti-Shah revolution. Once in power, with the Shah in exile, the working class and liberal movement was isolated and undermined by Khomeini, leading to a new form of tyranny. Khomeini was able to skillfully manouevure different factions and forces. He talked the language of anti-imperialism and helping the poorest, while destroying the gains of the revolution. Yet Marshall argues that much more was possible, and the outcome was by no means inevitable. The lessons of the 1979 have much to offer the workers movement today. Twenty years after it was written this book still has value, sadly it is out of print. For those who want to read more about Iranian history and the current period, this article is an excellent starting place. This is an unlikely Marxist novel. Now that's not to imply that this is some clunky Stalinist era-story, telling of the great successes of Comrade X as he strives to help the Soviet Nation to acheive greatness. Rather, this is a novel written by someone who has a Marxist understanding of the world, plus, I imagine, some experience of the upheavels that French society went through in the 1960s and 1970s. "The reason why Georges is barreling aling the outer ring road, with diminished reflexes, listening to this particular music, must be sought first and foremost in the position occupied by George in the social relations of production. The fact that Georges has killed at least two men in the course of the last year is not germane. What is happening now used to happen from time to time in the past." The George of the above paragraph is an ordinary travelling salesman, who drinks too much, as a couple of kids and a beautiful wife. In his past, he was a radical militant - from, oblique comments refering to Stalinists - I presume, some sort of Trotskyist organisation. He still retains some of his previous understanding of the world, though it's perhaps now clouded by cynicism. The author doesn't try and shove marxism down your throat. As my earlier quote points out, the big picture of the novels character is determined by larger social forces. But the detail of the story depends on small individual actions. In George's case, his helping an injured man from a car wreck, sets him up in the sights of soome hired gunmen, who hunt him the length and breadth of France. George goes on the run, hiding out in France's small towns, and eventually escaping his death sentence with a mixture of luck (good and bad) and violence. The ending is neatly done, leaving the story with enough closure to make the reader happy, but it's an uneasy happiness, George is changed by his experiences and not necessarily for the better. What happen's next is in our imagination and who knows were that goes. Note: I'm indebted to Pechorins Journal for his review of this novel that first brought it to my attention. I'd recommend reading it for a more detailed analysis of the book. Noreen Branson's excellent work looks at one of the great high points of the British Labour Party's history. In the early 1920s, when the Labour party still remained very much on the fringe of mainstream electoral politics, it started to make gains out of the radicalisation that followed the First World War. Almost immediately debates took place inside the organisation that would continue in one form or another to this day. Basically, to what extent should socialists within the Labour Party accommodate to mainstream politics in order to win elections, or fight for a more radical set of ideas, using electoral politics as a platform for the struggle for socialism. Nowhere was this clearer than in the East London borough of Poplar (now part of Tower Hamlets). George Lansbury and a number of other Labour candidates took a majority on the local council in November 1919. Lansbury was a well known socialist and pacifist. He and many of the other newly elected councillors had long roots in the socialist and trade union movements locally. On the back of increasing radicalisation, they were elected to improve the lot of a borough, which was then, as it is now, one of the poorest places in England. Initially the election of Lansbury et al, had little impact. They made some significant changes to local services, building baths, increasing library use and so on. But then, as the economic crisis of the early 1920s started to take hold, they set upon a path that was to bring them into radical confrontation with the government. This hinged on the allocation of rates. 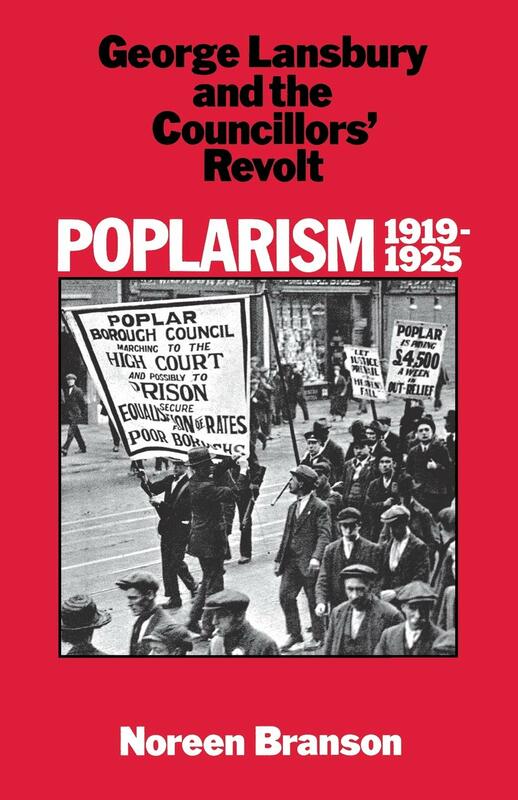 The Poplar councillors recognised that the existing system, whereby all the London councils paid into a pot and money was then distributed back out, was discriminatory to the poorest of boroughs which had the most need to help the poor and unemployed. The Poplar councillors refused to pay a section of this money to the government, instead spending it on employing the unemployed and ensuing poor relief at much higher than normal levels. This illegal action, though clearly morally fantastic brought down the wrath of the courts, and the Poplar councillors served weeks in jail, until they were released by the pressure on the government from outside. The story is a complex one. The Poplar councillors refused to bow down to the powers that be. Mobilising thousands of local workers in a huge protest movement that started to radicalise the wider London population. But this was not in the interests of the fledgling Labour Party, many of whom wanted to court legitimacy to ensure they were seen as respectable. Noreen Branson's history is detailed and passionate. Particularly if you've been involved in radical East End politics at any time since the 1920s - she draws out the problems that face those who would struggle for radical change using bourgeois methods. The councillors were indeed up against a situation which was new at the time, but which has faced many dedicated socialists since. Convinced of the need for fundamental changes in the system, such people have believed that if elected they will be in a position to make a major impact on the lives of those they represent. But once elected, whether in local or national government, they have found their opportunities are smaller than expected. They are hemmed in by the structure of property relations which in turn is reinforced by administrative ties and legal props. They are bound down by the financial fetters imposed from on high. The existing framework is too strong for them. Many of the victories of Poplar are considered normal today - that working people should receive unemployment benefit when thrown on the scrap heap of the dole. Family Allowances that don't force extra suffering on larger families. No means testing and so on. But the real lessons from Poplar's struggle is that fighting for change means mobilising large numbers of people, and socialist organisation is crucial to do that.